Description: "All small potions are red. 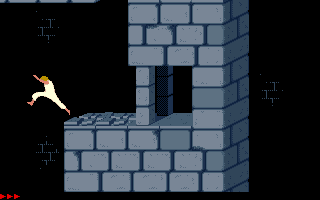 More than two dungeon graphics have been used. Levels have quest-like layouts." new comments and replays. comments: I took a look at this mod yesterday. I enjoyed it. Lots of interesting LPs to obtain, sometimes more than one in a level. Kinda annoying that blue potions look like red potions. What I liked most about it is its use of space, you feel like you really go (jump and run to) places and aren't struggling just to reach the next screen. 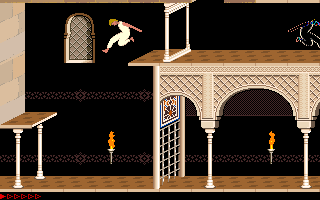 What I disliked most about it is that you can get stuck or die by jumping or running to places without it being your fault, because you can't - but need to - know what's in the next room(s). I really enjoyed this mod. I like that puzzle-like style, and I normally don't play harder mods but this is one exception. There is a way to distinguish health potions and poison potions, just look closely to them and compare. 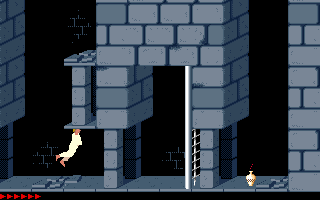 What I didn't like was the princess level, I followed the gates opening and entered to the green door, but then I'm in the copy protection level and then started from level 2 :( ... didn't know there was another way... And, in level 6, that guard waiting to kill me and I couldn't find any other way than using the cheat to see other room, meanwhile I moved to get behind the guard, and then returned to the previous room, and kill him... So the cheat is necessary in this mod.